Below is a brief outline of what to expect from each class. We run a wide variety of classes so there will be something for everyone - whether you are wanting to light the internal fire or get your zen on! A slower paced class that focuses on correct alignment and getting the most from your yoga practice. It is a flow yoga based class aimed at stretching and strengthening the body but with focus on alignment. We take the time to look at how the body should be aligned in poses and offer options to modify depending on your needs. To end the class, guidance on breath control (pranayama) and relaxation will help to bring a sense of calm and well-being to the body and mind. Suitable for all levels including those completely new to yoga as well as being useful for students who want to step back from faster ­flow to work on alignment. In this Lotus Flow vinyasa yoga class we combine movement with the breath to create an energising and detoxing flow. Classes will be taught based on themes with backgrounds rooted in either Traditional Chinese Medicine as Seasonal Yoga or the Myths & Philosophies of the Ancient Indian principles and Bhakti Yoga. Through this powerful connection of body & mind, these classes can help lower stress levels, promote health, flexibility & strength, and a feeling of well-being. 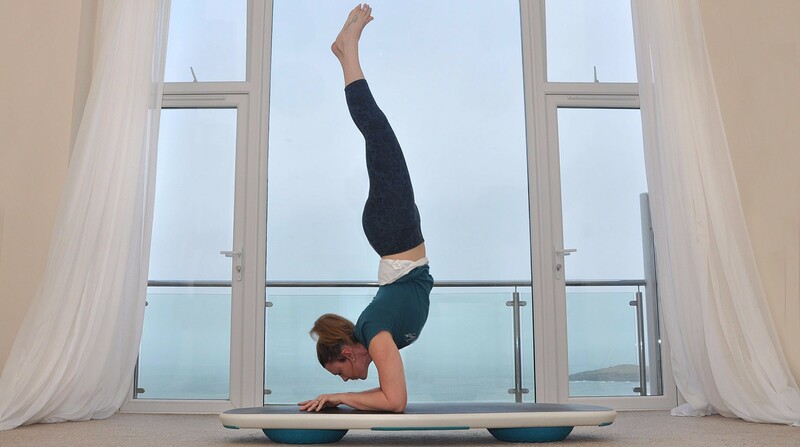 Suitable to all levels, however if you are relatively new to flow yoga it can be a good idea to try a few of our FOUNDATION classes or BEGINNERS COURSE before coming to ENERGISE to get a solid foundation into your yoga practice. An awakening yoga class designed to stretch out and open up your body, energising you for the day ahead. Watch the sun rise and the sky become lighter over the ocean from the mat whilst you practice! Suitable for all levels and beginners are welcome. Yin yoga is a slow-paced style of yoga with poses that are held for longer periods of time. Three to five minutes or longer per pose is typical and props may be used. Yin yoga is a great practice for improving flexibility in the body and also for increasing circulation to the joints. Suitable for all levels and beginners are welcome. People with less mobility may find this a great class as there is no dynamic, faster paced movement. A fun, faster paced fl­ow yoga class that focuses on core stability and increasing ­flexibility throughout our bodies. Core strength will help you align your body, build up protection for your lower back and help you move more efficiently. A great class for those interested in fitness especially surfers, paddle boarders, runners and cyclists looking to stay strong and supple, as well as anyone else who is wanting the benefits of having a stronger core and bendier limbs! Classes finish with focus on the breath and relaxation to gather the benefits of the physical work. Suitable for all levels however it is recommended that you are familiar with a sun salutation and have the mobility to move down to the floor and up again relatively quickly to attend this class. Great class for those with an established yoga practice or a good level of fitness looking to combine yoga into their routine. The first half of this gentle & balanced class will stretch out and move your body, opening hips & shoulders so that sitting becomes more comfortable and posture improves. In the second part, we’ll be exploring different styles of meditation to help settle our minds and diminish the stress & anxiety that can build up in our lives. Very Beginner Friendly! Suitable for all newbies and returners to Tai Chi & Chi Kung! Tai Chi is a form of moving meditation. The solo movements of Tai Chi Chi Kung are fairly specific to areas of the body and there mental/emotional connections ie. knees = flexibility. Much like a first aid kit. Easy to learn and experience. The Tai Chi forms or patterns link these solo movements together. They mimic more complex patterns of behaviour. As you refine these movements you refine those behavioural patterns. The class explores both aspects. Not physically challenging it is suited to all ages. Very good for centring the mind and relaxation. Come comfortably dressed. The movements are done standing, no mats required. Join us every Saturday morning for our complimentary 20 minute Morning Mantras! Mantra is a powerful tool to connect with the energy of our hearts, boost our feel good vibes and inspires positive thinking. We sing 6 signature mantras with the beautiful sound of the harmonium to help us wake up and connect with our day. We sing in Sanskrit (the yogic language) through call and response so you can learn each mantra as you go and guided song sheets are provided. This class is complimentary and a great addition to your yoga class before or after! Credits will be refunded if the booking system accidentally takes one! Oceanflow HOT yoga classes are held in our specialised HOT yoga studio at temperatures of 40 degrees and humidity of approximately 40-50%. This 75 minute class uses the classic series of 26 postures to work every muscle, gland and system in your body, allowing detoxification, healing and strength building. We do the majority of the postures twice and each posture we hold for 30 seconds to a minute before coming out of it. There is no flow in this class, it is a series of static holds. All levels and abilities are very welcome including absolute beginners. This class is broadly based around the postures of the Ashtanga Primary Series and involves more flowing movement than the classic HOT sequence and so the room is kept at a slightly cooler temperature (30-35 degrees). Suitable for all levels however some experience of vinyasa yoga is recommended before taking this class ie. knowing your way around a sun salutation is useful. This is a great class for those with an established yoga practice or a good level of fitness looking to combine yoga into their routine. Hot Fusion is a sequence inspired by the Baptiste Power vinyasa practice, which combines power and strength with softness and ease. It sits perfectly between the static, strength building Hot Yoga 26 postures and the more fluid, dynamic Hot Flow sequence With a large focus on how we breathe in postures and transitions, this class will challenge, cleanse and invigorate; preparing you both for a good night sleep or busy day ahead. At 32-34 degrees, you will sweat more than usual, helping to shift stagnant energy. Expect to leave feeling calm and centred and ready for whatever life throws at you. A class focused on deep stretches that are held from 2-5 minutes in a warm room with a temperature of 32degC. The poses will help to stretch out hips, shoulders and spine, working into connective tissue, fascia as well as muscles. The benefits of practicing this style in warmth include accessing postures easier than in colder environments, boosting detoxification and promoting relaxation. Beginners to yoga are very welcome and this class is a great one to double up with a earlier class to stretch out fully! A unique HOT class for those looking to deepen their HOT practice and understand the deeper meditative benefits of the Bikram series. The 26 postures are performed in silence with a teacher guiding the changes but with no alignment cues. The word “Go” indicates the start of the posture and the word “change” indicates the time to come out of the posture. This class is suitable for those who are quite familiar with the HOT or Bikram series and can come in and out of the postures without guidance. As a general rule of thumb, we would suggest having taken ten HOT YOGA classes before coming along to this class. This allows you to get enough sessions under your belt to be comfortable with the alignment of the postures. You DO NOT NEED TO KNOW the sequence off by heart to attend this class. Re-read this last sentance lol. You will have the guidance of others practising around you to prompt you into which posture comes next. IMPORTANT…PLEASE ARRIVE 15 MINS EARLY FOR THIS CLASS.